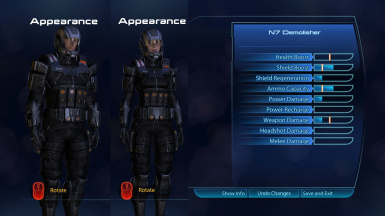 Improved N7 Battlesuit textures were added. 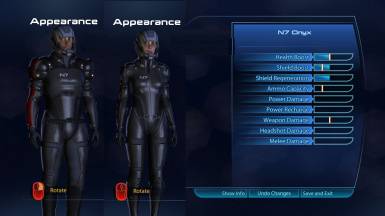 This moves the N7 logo on the chest, and adds the red and white stripes to the shoulders of the armour. 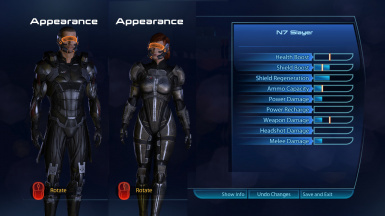 - The weapons in this mod were created by Bioware. EGM had no involvement in their creation. 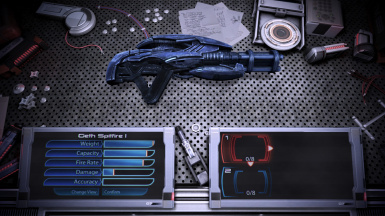 - The file added to this mod to enable the Collector SMG was created by Bioware. EGM had no involvement in its creation. 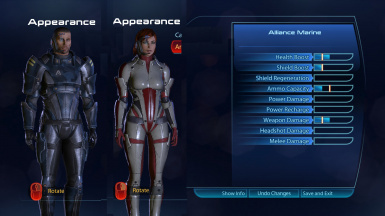 - The file I have used is a renamed default Bioware file. EGM has had no involvement in its creation or modification. 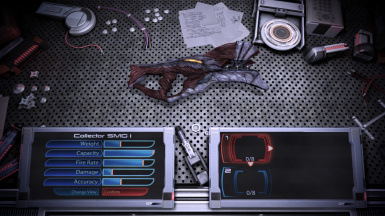 - The code used to add these weapons to the game was created by Bioware, then discovered and freely disseminated by helpful members of the modding community. EGM had no involvement in its creation nor dissemination. In short, this individual accused me of 'stealing' something that has never, at any time, belonged to nor been altered by anyone other than myself or Bioware. Further if anyone has any such concerns, you may in the future wish to bring these to me before attempting, and failing, to have this mod taken down. Thanks to Shadohz I've finally fixed the Collector SMG issue. 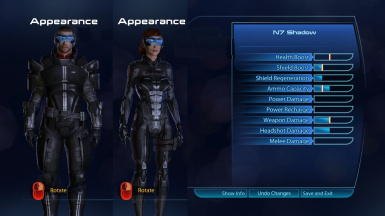 All weapons now function properly for both Shepard and squaddies. game ctd on selecting collector sniper...any solutions please?? Big fan of this mod. It's incredibly easy to install (just drop the file in the DLC folder and run AutoTOC) and the armour is amazing. They really fit the game and they probably should have been in there from the very beginning. I need help, if anybody can, I'd be truly grateful. 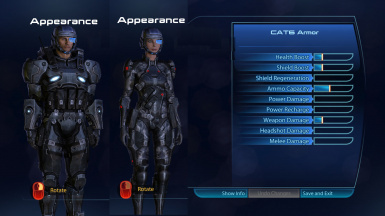 I'm having trouble with the CAT6 armor, the moment I select it (As it is the first armor) it completely freezes my game, I've waited for a while but not sure if it just has an insane mini-freeze period before it lets you pass it. If anybody has a fix for it, please respond. 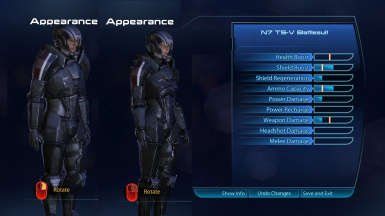 Use AutoTOC in ME3 Explorer. For anybody who's running into the CAT6 Freeze. It's due to what I already suspected. The DLC mods aren't as "drop in and play" as the author might suggest. 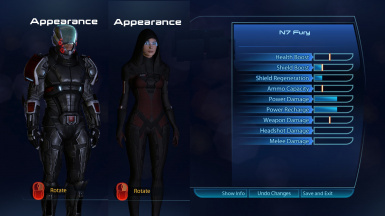 After you install the mod use ME3Explorer to AUTOTOC the new DLC files. After that the mod will work flawlessly. is this not compatible with egm or is it? Hey, could I possiblely get the weapons only version? 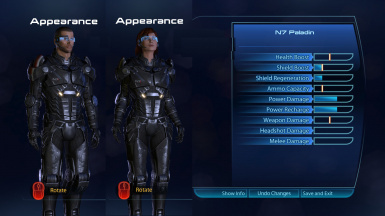 I already have an armor-mod installed from ModDB. the smg and spitfire work fine. 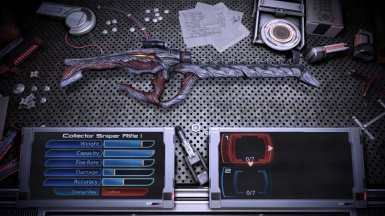 it's just the collector sniper rifle that is messed up.